So just what is Russia up to in the Middle East? In this hard-hitting essay, leading analyst of Russian affairs Dmitri Trenin cuts through the hyperbole to offer a clear and nuanced analysis of Russia's involvement in the Middle East and its regional and global ramifications. Russia, he argues, cannot and will not supplant the U.S. as the leading external power in the region, but its actions are accelerating changes which will fundamentally remake the international system in the next two decades. Dmitri Trenin is the Director of the Carnegie Moscow Center. 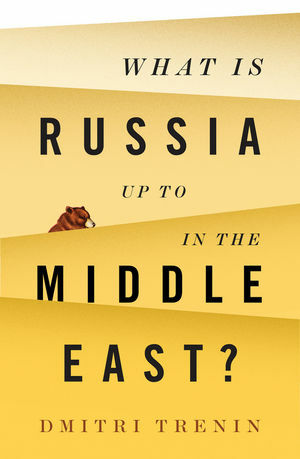 "A timely narrative of Moscow's noisy, though deftly executed and clearly efficient, re-insertion in the Middle East. Trenin is deeply familiar with the Kremlin's decision-making though cognizant of Russia's limited resources. Heavily informed by geopolitics, Trenin convincingly demonstrates the large impact of regional politics on the shifting equations among global powers." "Trenin offers an indispensable and authoritative account of Moscow's motivation in the Middle East. Rooted in history and lucidly told, he paints a compelling portrait of Russia as a power "with no permanent friends and no eternal enemies", ready to kick over regional tables on its global comeback to geopolitical top table." "How did Russia engineer its return to the Middle East? In this succinct, lucid account, Dmitri Trenin reminds his readers of Russia’s long historical ties with ​the region, and also of the domestic factors that have driven the Kremlin to pursue an interventionist policy there." "Trenin packs a great deal of substance into this slender volume."